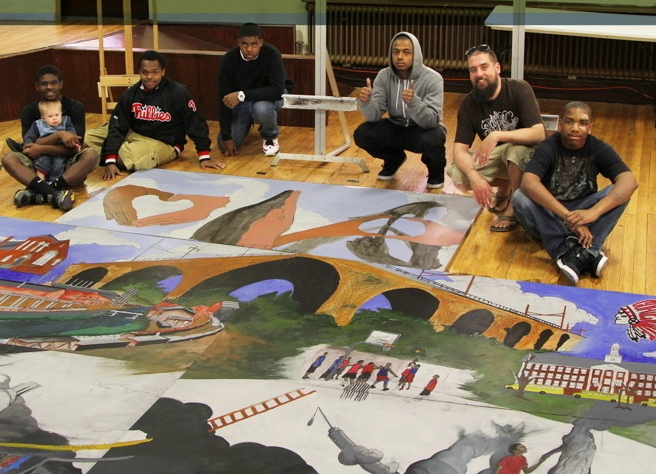 Teens show off the finished Darkness to Light mural at an unveiling ceremony at the Bridge Academy and Community Center in Coatesville. The glow generated by the Darkness to Light mural project continues, and its youthful creators will be recognized on Thursday, Nov. 21, at the Penn State Great Valley Conference Center, where the work is on display until Dec. 13. The public is invited to join the artists at a reception that will be held from 6:30 to 7 p.m. at the campus. 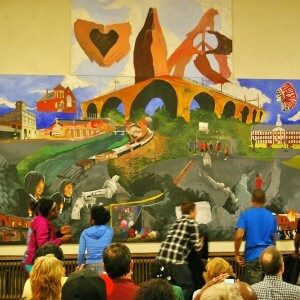 It will be followed by a lecture from Jane Golden of the renowned Mural Arts Program in Philadelphia from 7 to 8:30 p.m. Sponsored by the Art Partners Studio and Bridge Academy and Community Center in Coatesville, the Darkness to Light mural represents a collaboration that brought more than 20 teens into a world of brainstorming, sketching, and painting. 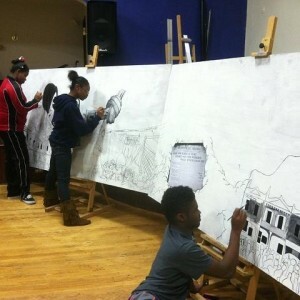 As conceived by the young artists – some of whom picked up a paintbrush for the first time during the project – the five-panel mural depicts the city’s past, present, and their dreams for a better future. Students worked on the mural at the Bridge Academy and Community Center on Olive Street in Coatesville for nine months. The bottom two panels depict dark events from Coatesville’s past, including the arsons and a newspaper headline about the 1911 Zachariah Walker lynching. 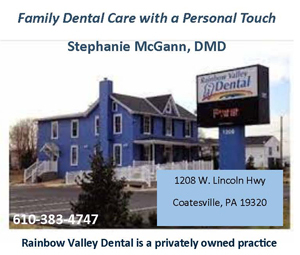 The middle layer illustrates Coatesville as it is today, capturing familiar landmarks like Lukens Steel, the high bridge, Scott Middle School, and the high school logo. Finally, the top section features hands of different skin tones, signifying harmony. Two combine to make a heart, another set is joined as if in prayer, while others form a peace sign. Some of the creators of the Darkness to Light mural surround the five panels after their completion. Lindsay J. Brinton, executive director of Art Partners, said the collaboration with Penn State occurred because Craig Edelbrock, chancellor and associate dean of the graduate school at the Great Valley campus, is a proponent of offering the school’s expansive gallery space to local institutions such as the Wharton Esherick Museum, Historic Yellow Springs, and Chester County Art Association. Brinton said Edelbrock had interest in Chester County’s industrial legacy so last spring she introduced him to Coatesville, where he saw the Graystone Society’s collection of works by German–born artist Klaus Guido Grutzka, who had a fascination for machinery, as well as the Bridge Academy mural. The exhibition at Penn State “developed from there,” she said.